Please see last week’s Wisconsin Crop Manager Vol. 18(8) for a black cutworm scouting alert in corn from emergence through V5 stage. Remember to scout Bt corn hybrids for black cutworm as well since heavy black cutworm populations may overwhelm some Bt hybrids. This week, I provide a few reminders about seedcorn maggot, another potential early season insect pest of corn and soybean. Most conventional and all Bt corn seed, and a significant portion of soybean seed is sold with nicotinoid insecticide seed treatment. This seed treatment provides excellent seedcorn maggot control. Some hopper box seed treatments are also available. The following cropping system scenarios can increase likelihood of seedcorn maggot damage to germinating seeds and seedlings. These scenarios are important for organic and conventional growers who incorporate a grass or legume cover crop ahead of planting and/or who do not have insecticide treated soybean or corn seed. Adult female seedcorn maggot flies are attracted to fields with decomposing organic matter. 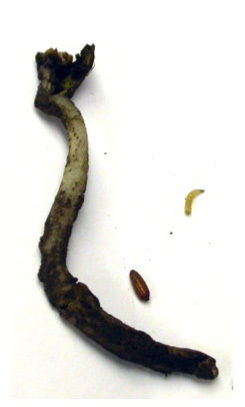 Fields where animal or green manure cover crops or weed tillage have recently been incorporated in spring are more susceptible to seedcorn maggot. The longer the time between incorporation of green plant material and planting, the lower the risk of attracting adult flies. A 2-3 week window usually allows decomposing plant organic matter to become less attractive to flies. Of course, weather conditions do not always allow growers to wait 2-3 weeks between cover crop or weed tillage and corn and soybean planting. Conditions that delay emergence, such as soil crusting or cold, wet weather will increase the likelihood of damage because seedlings take longer to emerge allowing more time during which seed is susceptible below ground to feeding injury. Soils with high clay content worked during the wetter weather are candidates for crusting. This can trap seeds below ground with seedcorn maggot larvae. A rotary hoe can be used in these cases to break up hard soil surfaces to enable soybean or corn seedlings to emerge. Seedcorn maggot can be an issue for untreated corn and soybean seed, however damage is not usually as severe in corn as when found in soybean. 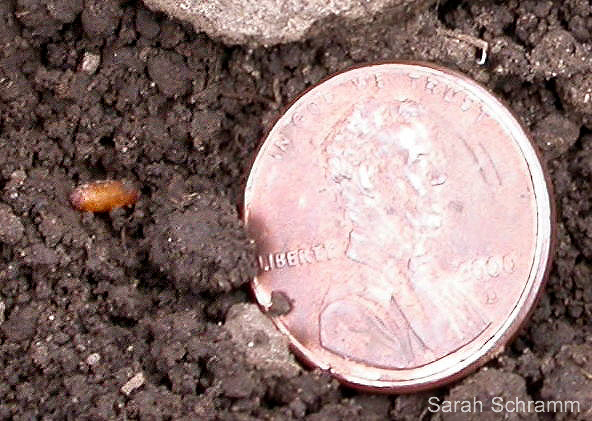 On soybean, maggots burrow into germinating seed. If the seed germinates, maggots feed in and on the cotyledons leaving brown feeding scars. Shoots may also emerge as “snakehead” seedlings, missing cotyledons altogether. On corn, all parts of the sprouting seed can be fed on. When it occurs (on soybeans or corn), seedcorn maggot damage is usually more widespread than spotty in field distribution. Seedcorn maggot overwinters as a pupa in the soil. We can use insect degree-days to predict adult fly emergence in spring. Beginning after ground has thawed, approximately March 1, degree-days are accumulated using the seedcorn maggot base temperature of 3.9°C (39°F). Peak emergence of the first generation of adult flies from the overwintering pupae will occur at 200 degree-days C (approx. 360 degree-days F). Peak emergence indicates that the population is increasing and egg-laying is occurring, thus planting during peak seedcorn maggot fly emergence can increase risk. 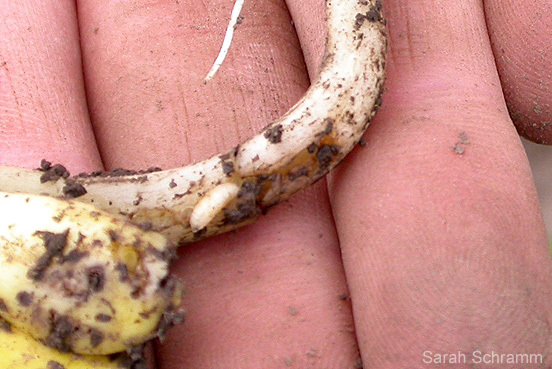 Seedcorn maggot typically has three generations per year in Wisconsin, but it is the first generation in May that is of importance to corn and soybean. Pupae are small brown, cylindrical ‘cocoons’ in the soil. 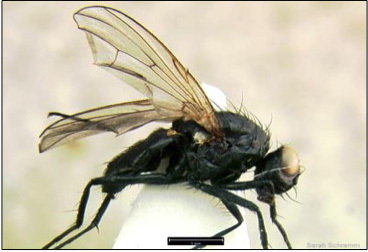 Adults are small dark flies with bristles on the thorax. Larvae are yellowish-white, 1/5-inch long when fully grown, legless and wedge shaped. There are no economic thresholds for seedcorn maggot. 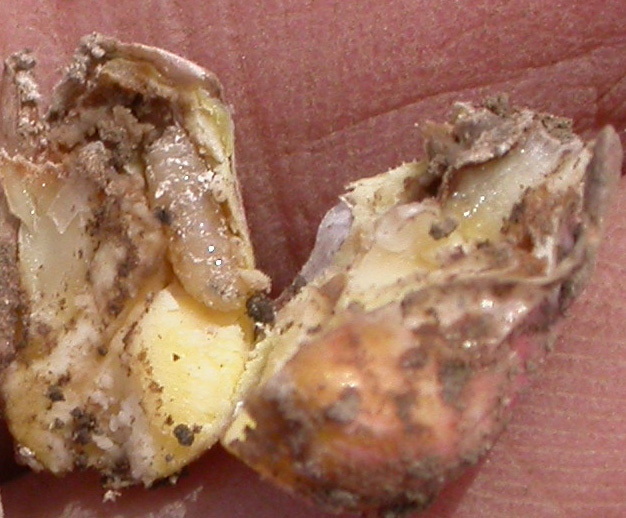 If seed treatments are not part of a cropping system plan, knowledge of seedcorn maggot life cycle and degree-days can help minimize damage by planting as close to possible during “fly free” periods outside of the peak flight emergence. To learn more about using insect degree-days, and seedcorn maggot degree-days in particular, please visit eXtension’s eOrganic webinar series archived recording from March 29, 2011 titled Integrated Pest Management in Organic Field Crops Webinar. In the second presentation (Cullen beginning at 12:12 minute mark) I cover the topic of using seedcorn maggot degree-days to plant around peak fly emergence.